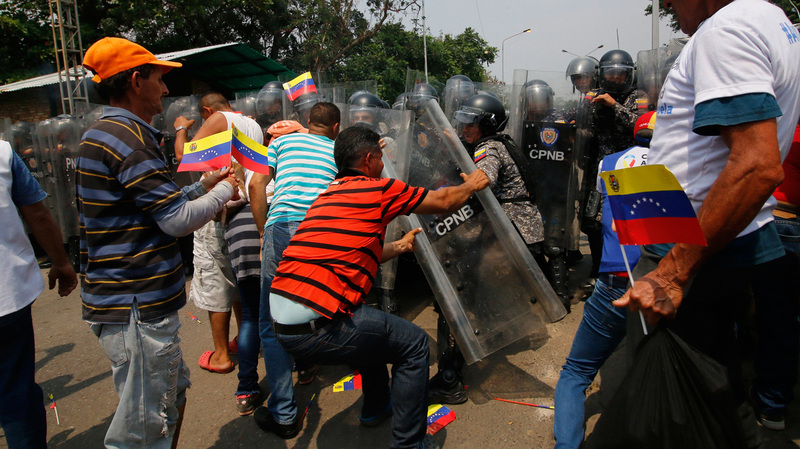 Venezuelan President Breaks Ties With Colombia Amidst Deadly Aid Crisis At least four people have been killed as protesters and security forces clashed over efforts to bring humanitarian aid into Venezuela against the orders of President Nicolás Maduro. Supporters of Venezuela's opposition leader Juan Guaido struggle with members of Venezuela national police at the Francisco de Paula Santander International Bridge between Cúcuta in Colombia and Ureña in Venezuela, on Saturday. At least four people were killed and hundreds injured as opponents of Venezuelan President Nicolás Maduro clashed with Venezuelan security forces over the weekend. Anti-Maduro activists were largely unsuccessful in their efforts to bring shipments of food and medicine into the country Saturday, according to reports from the borders with Colombia and Brazil. Venezuelan President Nicolás Maduro announced Saturday that his government had broken diplomatic ties with Colombia after the government there aided opposition activists in seeking to bring the aid into Venezuela. "Patience is exhausted, I can't bear it anymore, we can't keep putting up with Colombian territory being used for attacks against Venezuela," Maduro said in a speech. "For that reason, I have decided to break all political and diplomatic relations with Colombia's fascist government." Colombian diplomats were given 24 hours to leave Venezuela. Foreign minister Carlos Holmes Trujillo said Colombia would blame Venezuela's president if anything happened to its diplomats, Reuters reported. "Colombia holds the usurper Maduro responsible for any aggression or violation of the rights of Colombian officials in Venezuela," said the foreign minister. Maduro's declaration added to the tension in a rapidly escalating political and humanitarian crisis that has resulted in violent confrontations between activists and Venezuelan security officials. The first two deaths occurred Friday during violence in a Venezuelan town near the border with Brazil. More than a dozen were injured, according to multiple reports. The White House responded by saying it "strongly condemns the Venezuelan military's use of force against unarmed civilians and innocent volunteers." 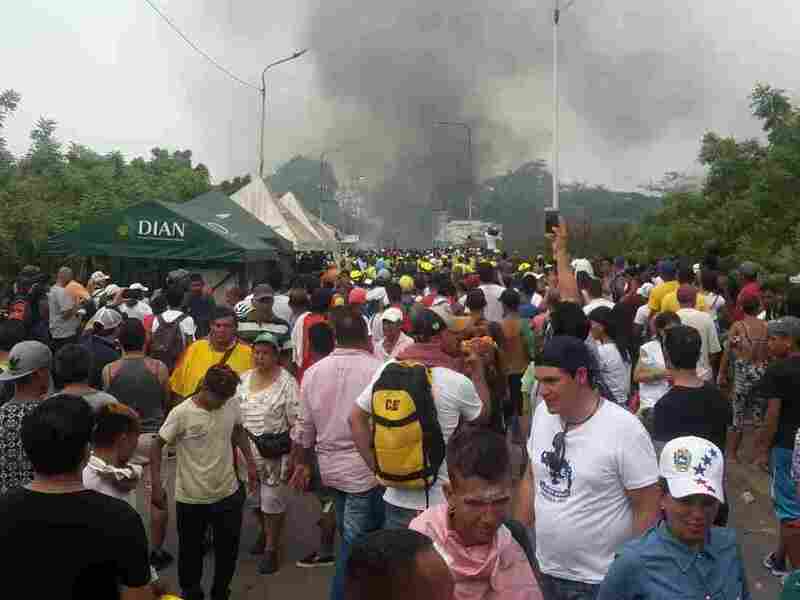 On Saturday afternoon, two more were killed and 18 were wounded in a separate clash in the town of Santa Elena de Uairen on the Venezuelan side of the border with Brazil, The Associated Press reported. Meanwhile, along the border with Colombia, troops fired tear gas to keep people away from border bridges. Hours later, a truck carrying humanitarian aid caught fire as it attempted to cross the border into Venezuela, Reuters reported. The clashes come as opposition activists are attempting to bring international aid into Venezuela to address food shortages, medical shortages and a mounting refugee crisis. Juan Guaidó, the leader of the opposition, has called for Venezuela's military to defy orders from Maduro and allow aid shipments into the country. Opposition leaders said at least one truck successfully conveyed aid across the Brazil-Venezuela border on Saturday. An aid trucks burns on the bridge between Venezuela and Colombia. 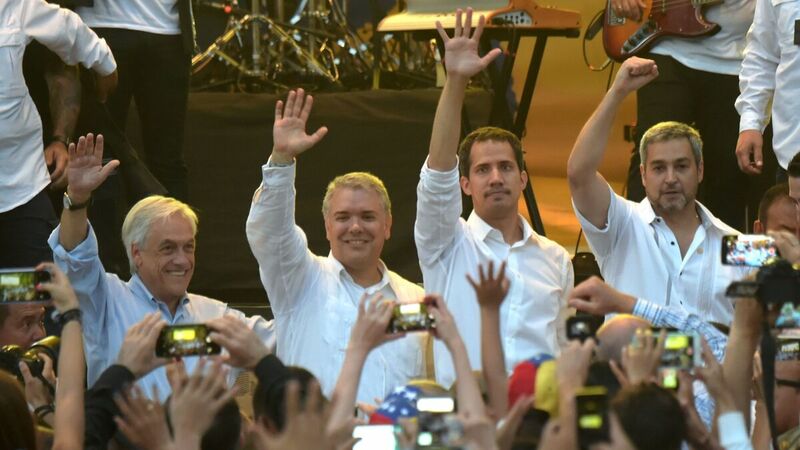 Guaidó — who has declared himself Venezuela's legitimate interim president and has been recognized as such by the United States and dozens of other countries — appeared with the presidents of Chile, Colombia and Paraguay at a concert in Cúcuta, Colombia Friday. On Saturday, the AP reported that Guaidó said he plans to meet U.S. Vice President Mike Pence on Monday, when Pence is set to land in Bogotá, Colombia, to discuss the Venezuela crisis with regional leaders. In a series of tweets late Saturday, Guaidó said he'll be part of that meeting and that "we must have all options open to achieve liberation" for the country. After Saturday's events, he tweeted, he no longer sees talks with the military as a path toward peace. "They are soldiers who at some point had an illusion for the military career and are now prisoners of terror," he wrote. Guaidó is banned from leaving Venezuela but reportedly said he crossed the border with the help of the armed forces. Five members of the Venezuelan armed forces deserted their posts on Saturday and joined Guaidó, calling him Venezuela's "constitutional president," according to the AP. The moment was captured in a video that Guaidó posted to his Twitter account. From left: Chilean President Sebastián Piñera, Colombian President Iván Duque, Venezuela's opposition leader Juan Guaidó and Paraguayan President Mario Abdo Benítez wave at the "Venezuela Aid Live" concert in Cúcuta, Colombia, on Friday. On Friday, thousands had gathered in Cúcuta for a benefit concert organized by billionaire Richard Branson to pressure the Maduro government to allow humanitarian aid into the country. The State Department said Friday it was "pre-positioning" an additional 178 metric tons of aid in Boa Vista, Brazil, near the Venezuelan border. But Venezuelan Vice President Delcy Rodríguez tweeted on Friday that the government would implement a "temporary total closure" of three main bridges between Cúcuta and Venezuela. It came a day after Maduro ordered the border with Brazil closed. Maduro views the aid shipments as a Trojan horse meant to destabilize his government. Maduro "says it's kind of a pretext for a U.S. invasion of his country," noted correspondent John Otis in an interview with Weekend Edition Saturday. "The opposition wants to get rid of Maduro, who's been in power for the last six years during this economic meltdown," Otis said. "The Trump administration is fully behind Guaidó's efforts to try to get humanitarian aid across the border to sort of try to provoke a mutiny and bring down Maduro." But beyond the political fight, Venezuela's need for aid — in the form of food and medicine — is genuine. Venezuela has faced a growing humanitarian crisis for years, with shortages of food and spiraling inflation that's driven millions from the country. The United Nations said Friday that 3.4 million people have now left Venezuela, many on foot. For those who haven't left, an estimated 80 percent of Venezuelan households are food insecure, which means they do not have a reliable source of food, Tamara Taraciuk Broner, a senior researcher with Human Rights Watch, told NPR. "You see people, vulnerable people, eating off the trash," Broner said, citing a report by universities in Venezuela that indicates "people have lost an average of 11 kilos [24 pounds] in one year." Broner said that in some cases, the "government has made a deliberate attempt to hide the official data on the extent of the crisis." "The only time that a health minister decided to release epidemiological data in recent times, in January 2017, the bulletin that she released indicated that only in 2016, in just one year, maternal mortality increased by 65 percent, and infant mortality increased by 30 percent. "In a way, that's very consistent with the repression in this government. That minister was immediately fired, and since then, there has been no official data released by the Venezuelan government," Broner said.